Dell currently offers two variants of the Inspiron 13 7000 2-in-1 – one packing an AMD Ryzen 5 2500U with an integrated Radeon Vega 8 GPU and the other packing a more powerful Ryzen 7 2700U with an integrated Radeon Vega 10 GPU. The systems come with either 8GB or 12GB DDR4-2400 RAM, which can be expanded up to 16GB via a built-to-order configuration. In terms of storage, the notebooks come with a 256GB SSD and lack a traditional HDD. 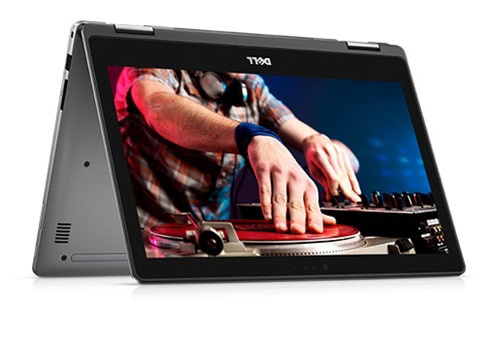 The screen on the Inspiron 13 7000 is a 13.3-inch IPS TrueLife gloassy LED with great brightness and viewing angles. The notebook also includes a wide viewing angle webcam with IR which brings support for facial recognition using Windows Hello. In terms of I/O, the Inspiron 13 7000 2-in-1 packs a 802.11ac WiFi+Bluetooth 4.2 module, a USB 3.0 Type-C port, two USB 3.0 Type-A ports, an HDMI out, an SD card reader, and a 3.5mm combo jack. These models also come with a backlit keyboard and stereo speakers with Waves MaxxAudio Pro enhancements. On the downside, the laptops only pack a 42Wh battery which is rather small and 10% lower when compared to other Ryzen Mobile powered 13-inch notebooks. The Inspiron 15 5000 notebook features a 15.6-inch FHD IPS display in both touch and non-touch configurations. Besides Ryzen 5 and 7 CPUs for laptops, Dell also offers this with a Ryzen 3 2200U with integrated Vega 3 graphics on offer. The Inspiron 15 500- can be equipped with up to 32 GB of memory, except for the low-end SKU which only takes up to 16GB of RAM. The highest end model comes with 512GB SSD whereas the others only have a 1TB 5400 RPM HDD, which is surely disappointing. The Inspiron 15 5000 does not have an IR camera either, but has a Windows Hello-supporting fingerprint reader, and it also gets an optical drive. The notebooks are open for pre-bookings in the US starting at $730 for the 2-in-1 range and $630 fo the Inspiron 15 5000 laptop. High-end configurations go all the way up to $1,019, depending on the parts you choose. Compared to the Intel variants, the Ryzen powered laptops are around $100 cheaper and come with a better integrated GPU making the package a rather sweet deal.